NYC, 02/15/2019, 1:00PM. 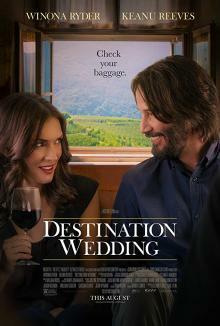 Destination Wedding (2018): Romantic Comedy Starring Keanu Reeves and Winona Ryder. 90 min. Director: Victor Levin. Starring Keanu Reeves, Winona Ryder, Dj Dallenbach. Production for Destination Wedding wrapped in central California in August 2017. It was released on August 31, 2018.